Having an outdoor space, no matter how well it’s designed, requires a few extras in order to use it to its full potential. The overall design should be reflective of your style and don’t forget comfort! When I say comfort, I’m not only talking about what you’re sitting on or putting your feed up on. I’m talking about keeping cool during the hot summer afternoons! 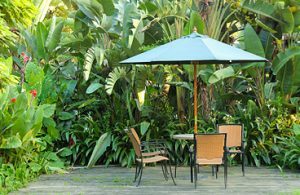 Creating shaded areas in your outdoor space is the first step to take so you can enjoy spending time there and keep it cooler. It would be ideal to have a few perfectly placed trees that provide just the right amount of shade, but chances are that’s not the case. So what are some budget friendly ways to create shaded spots? Use a simple and temporary solution like an umbrella. 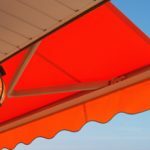 When choosing an umbrella, opt for one that is adjustable in both height and angle position, that way you can change the position of the shade it creates as the sun changes position throughout the day. For a more unique look, try using a shade sail. Shade sails use a flexible membrane that you tension between three or more anchor points, similar to a ship’s sail (which is where they got their name). 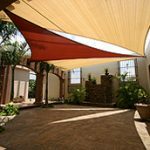 A cost effective shade solution, they also come in a variety of colors that can accent your overall outdoor space. Build a structure that you can put a roof on such as lattice, horizontal beams, or even a solid cover. 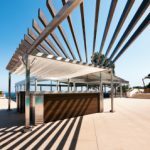 A solid cover will certainly provide a shaded area, but if you opt for lattice instead, you can use it to tie into your overall design scheme. Another option that is increasing in popularity is cloth materials draped over an overhead structure, creating an elegant, high-end look. 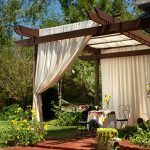 Picture enjoying your outdoor space with colorful outdoor curtains that you can tie back to let in the light or keep closed for a more private feel. 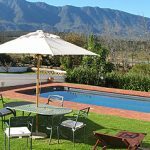 Having an outdoor space that can be used to its full potential will not only allow you to enjoy it more, but it can add value and increase the visual appeal of your home. What tips do you have for staying cool in your outdoor space?